We started our day in Cana of Galilee and the renewing of our wedding vows. Always an emotional and moving experience. 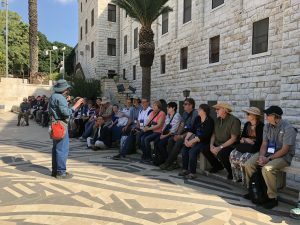 From there we went to Nazareth to visit the Church of Annunciation and where I gave my talk “A Day in the Life of the Holy Family”. And authentic Nazarene lunch and then onto the Mount of Transfiguration for Mass and to explore the top of the mountain. Fr. Nathan is short but excellent and dynamic homily you can see/hear here. Free afternoon for everyone to enjoy this Sea of Galilee and the wonderful accommodations at the Ron Beach Hotel. I am following you on your Pilgrimage and was so touched to see you renew your Wedding vows at Cana. I prayed for you as I witnessed you renewing your vows to one another. and am so thrilled to be “with you” on your Journey with Jesus via these videos. May Our Lord bless you and all those you are traveling with. And know that I continue to keep the Prayer Candle in our home lit for you. Previous post: “Life is about the Journey, not the Destination!” Huh? !